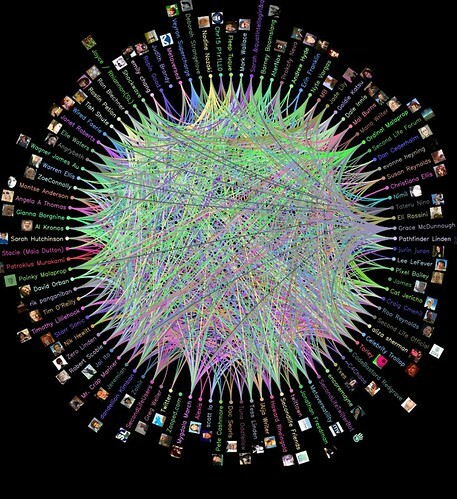 I finally scrutinized an image I had captured from tweetwheel visualizing the connections between my friends on twitter. It reveals a great mix of humans, second life avatars and anonymous twitter-folk. The original here is more legible. On a related note, New World Notes covered the virtual world/web 2.0 connection yesterday. 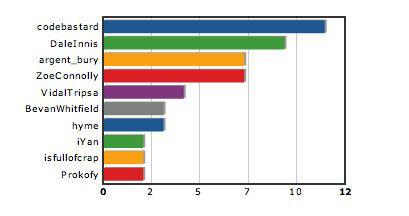 It was gratifying to see a Gartner analyst and a blogging avatar (yours truly) given equivalent pundit weight. I can't say for sure whether that speaks well of avatars or poorly of analysts. That is exactly why I ditched my blog & Twitter accounts. I originally had a "rule" on Twitter that I would only follow people I had actually met in-world, but it quickly fell away and things got out of control. I want to live in Second Life®. However, I'm finding it nearly impossible to meet anyone there and regret having ditched the outside world. I have had much the same experience of getting to "know" people via Twitter whom I haven't met in either SL or RL. I think that's one of the most interesting things about Twitter. Since I reveal both my RL and SL identities in both SL and Twitter--and Facebook, for that matter--it has seemed to me that this is a particular aspect of Twitter, not so much about SL. Unlike unsolicited friends on facebook, or running into people by chance, or being introduced, following strangers on Twitter is based totally on what they have to say in 140 characters or less. It does have a way of stripping away the chaff (even when it is frivolous tweets). And unlike blogs (I read many people's blogs whom I don't know), the chance that someone will at least take a look at your tweets or even follow you is high, leading to the creation of Twitter relationships based only on those 140-character messages. Wild!